Yoga Therapy is designed around the principle of prana – your body’s life force. Yogis believe the energy that heals your body is your spirit. When that energy leaves, the body dies. The same energy that is digesting your food is the spirit in you. It has so much more potential than just keeping us alive. It’s nature is to return us to the source from which it came. That energy, when freed to its catalytic momentum, can carry out deep healing at the subtle levels just as it does at the gross. "Back in August i learned of Tania Wildbill and her yoga therapy. I had alot going on emotionally and thought I want to work this out in a different way. I contacted tania and I was a little scared of the unknown but I figured I had been to different kind of therapies so what did I have to lose. My first session was a very emotional session for me in so many ways. I was not dealing with loss of loved ones like i thought I had under control. Tania took me wayyyy back to the loss of my father a husband and a granddaughter that had just been stripped from me without notice to move to Florida. The emotions were so raw and I will say i honestly could not stop sobbing . But after that session my heart felt lighter something changed I cannot tell you what happened to me that day but it was so Good! As tania and I worked thru more sessions I have an ankle that has 10 pins and a plate . I baby this ankle as sometimes I can just turn wrong and I would feel pain. Winters for my ankle have always been grueling from the arthritis. I can tell you that I have had no pain or throbbing through this intense winter. I told Tania one day the insurance companies are going to recognize this therapy and accept it for so many reasons.. depression, suicidal situations, body ailments and so many health reasons. I am so happy I made that call to Tania Wildbill the day I did as it changed alot of things for me both mentally and physically. I'm thrilled to see where she is going to go with this awesome therapy. All of you who want a natural healing thearapy don't be afraid to call her it truly can change your life in many positive ways!" "Until last Friday, I carried a map of trauma on my skin--one etched there since childhood and reinforced by some poor choices I made as an adult. The map had burned itself into my body, all the way down to the cellular level. It sent me to many doctor visits for fibromyalgia and depression. It begged me to wear extra clothing and body fat to cover it. I've tried many things to make myself feel "better," including years of talk therapy, but I hadn't truly seen the connection between body and mind--until I met Tania. 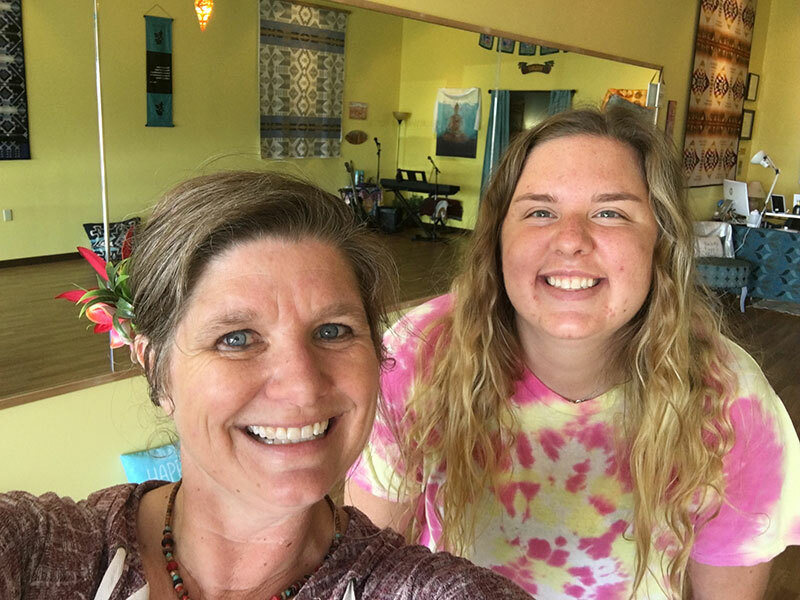 The ninety minutes of yoga therapy with Tania in her Mission studio guided me toward releasing much of the tangled highways of pain and memory that had invaded my joints and muscles. It was primal and freeing. It was some of the hardest work I've ever done. As I raced toward Wellness Wave for my appointment that day, I didn't know what to expect. I surely didn't expect to cry, but the tears came. Lots of them. And I didn't expect to yell and make the sounds I had made during childbirth, but I did. Yoga therapy was a painful, joyful experience. Before I knew it, the scorched places inside my body had cooled because there was nothing left to fuel them. The white-hot road map I'd been holding onto had changed into a fortune-hunter's treasure map that led me to my center of gravity. I literally danced out of the place, hips swinging and happy! When I looked into the rear view mirror, I swear my skin was glowing. The fire had come outside." "Today is my 7th class and 1 year since my double back surgery bringing me back from becoming half a vegetable. No joke, I have lost about 10 lbs and the pain level in my spine has gone from a constant 8 to a “holy hell” 3 :) this woman is seriously the best thing to happen to Pendleton, I am so lucky to have her as my Guru and I know that I will go so much further in my yoga journey"
"Woooow, Tania is absolutely AMAZING! I had a yoga therapy session with Tanya today. It was the most incredible experience ever! Totally life changing for me. Tania does an exceptional job. I had lower back pain and I felt so much relief after our first session. Tania has a special gift and everyone should experience her magic touch. Also, Tania's yoga classes are awesome. I love the energy, relief, and positive vibe I feel each and every class. Thank you Tania for changing my life and mindset." "Yesterday I was blessed with a Yoga Therapy session with the amazing Tania Wildbill. I can’t fully describe what happened in that room, but it was amazing. I was hesitant with the timing, because as many of you know I was recently in a very severe accident that shattered my jaw in several places along with my TMJ, and my body felt like it’s been through a ringer; the truth is it could not have been better timing! Immediately after the session I felt so amazing, I felt aligned, my body didn’t hurt, nothing hurt Then I got tired, oh my goodness I just wanted to sleep; I haven’t had a good quality rest in weeks. I’m constantly tossing and turning, trying to find position that my body is comfortable and doesn’t hurt my face (both sides are broke), but last night was different; I fell asleep so easy and I stayed asleep until 5:30 this morning, and woke up feeling refreshed and energized. If you have been considering a Yoga Therapy session my only advice is to trust your instructor and trust yourself; know your limits but don’t be afraid go to the edge of them either, I promise it will be worth it." "I’ve have now been attending Yoga with Tania for two months, and I had my first Therapy session today. It’s been a year since my double surgery and still have some residual pain. I had wanted to go live since I saw a friend of mine do it two years ago. I was immediately comfortable and at ease; and once She started, I felt stretches in my limbs and spine that I have never felt before, and I loved it. Felt a lot of the family turmoil rise from my repressed mind, and they released via laughter. By the end of the session, I sat and walked with perfect posture for the first time in about 19 years. If you’re having any thoughts or hesitations about doing a session, just go for it! You won’t regret it. "I would just like to say mahalo to Tania Wildbill! so incredibly inspiring to see what she has turned her passion into! i’ve seen her change lives with yoga and yoga therapy and that’s just what she did for me today! i have been struggling with asthma my whole life, and being a swimmer i kind of just got used to not breathing.. but it is so important out of the pool haha! being over in Hawai’i for college is absolutely amazing but my breathing was so bad i felt like i didn’t get to enjoy all that i could have this year because of it holding me back. i had a very scary experience over in college with my asthma and i wasn’t sure what was going to happen. as soon as i was done with school i came to yoga and immediately had this feeling that it was going to help me. i have came to yoga with Tania in the past while i was swimming at home and i loved it! after this scary experience of not being able to breathe almost every single day and it turning into something worse really hit me and i knew i had to come back to yoga. today i went to yoga therapy with Tania and it was the greatest decision i have get made. Tania has the greatest aloha vibe ever and we will forever be connected through swimming & the aloha vibe! today is the first time i actually got a full breath in and felt it go through my whole body. For so long i feel like i’ve been longing to find my breath, and today i did. thank you Tania for helping with this journey because i know it is just the beginning! i appreciate you and your work so much! i encourage everyone who has been struggling with something to go to yoga therapy with Tania, it has changed my life after just one visit! mahalo and aloha Tania!" Yoga Therapy is good medicine. It instantly brings me to a very grounded state and I am rejuvenated after a session. There is a sacred presence with my breath and movement where my mind, body, and spirit are nourished. The support and assists I receive in Yoga Therapy rids any tension and stress in my body. I can feel my nervous system calming. My awareness with myself is strengthened and it brings me emotional clarity. Yoga Therapy supports me physically through improved range of motion and flexibility and also mentally, I am more centered and can carry the resilience with me into my professional and personal life. I'm grateful to have Tania as my yoga teacher for almost ten years. Tania offers her yoga knowledge to groups and 1-1 yoga therapy sessions but she also embodies the practice that ripples light into our community. I pray our community continues to heal and thrive like we deserve. Hi, I’m Sally Kosey I’m a enrolled member with The Confederated Tribes of the Umatilla Indian Reservation. I’m writing you to give you an idea on how this therapy helped with my ADL. due to a pinched nerve in my back. During this six weeks Tania saw me in private, she helped me with the following, I’m awaiting surgery, I have had some relief on my back, due to the pinched nerve it cannot be fully restored until my surgeon gets it back to where it needs to be and restored the blood flow to my hip and leg. I will be able to continue to use these methods during my recovery. I’m a large woman, and Tania showed me how I could get myself up and off the floor in case I had fallen. I learned how to stretch without causing pain to my back, rolling off my left side to right side. Tania was able to do leg pulls that helped my back and my sore leg, relax and then demonstrated how I do this at home to relieve the pressure off my back. Tania showed me leg and arm movements to free up the restricted back and legs, while lying flat on the ground. Breathing techniques on how to breathe and relieve pressure and relax easier. I have not been able to sleep for quite some time, Tonia has been able to show me breathing techniques and controlling my breathing, I can now lay down breathe exhale relax, repeat and fall asleep. My posture is getting bad, she worked with me on standing up and walking, pulling my shoulder back, breathing and looking forward, talking steps with ease, (this is hard as I have walked this way so long, and I still slump. Taking time with me but accomplishing different techniques to help my back, walking has helped. I not cured but do have some control with my back pain. Last week, I had an experience, a one hour experience, that so dramatically shifted my reality, that I feel inspired to share personally on social media—not something I typically do at this level but like is common these days, I’m inspired by and have benefited from others who’ve shared personally. I’m still working out some recurring injury from 2011—when a traumatic double car accident (the first, only a week after ACL surgery) rocked my world in some pretty awful ways and required a year+ recovery time. Then there’s the unseen barriers to fully realizing some of the action and accomplishment I’ve been eager to manifest, like living fearless and whole-hearted, unafraid to stand in my vulnerability and let my little love light shine, not to mention finishing my novel and running a marathon, or something like that. I don’t yet have all the words to describe the feelings and sensations that overtook my body last Thursday, sometime in the early afternoon, while lying on my back on a yoga mat in the back room of Wellness Wave. There was music but I couldn’t hear it as I melted into a deep delta-wave state of meditation. My hands tingled with the building energy at the same time my arms felt like lead weights, barely able to rise off the soft blankets that swaddled them. I felt a strange sensations across the familiar landscape of my body as Tania stood at my feet gently directing me to lift my leg, my hip, feel the release, let it go and breathe, deep breath. She encouraged me to let go and free whatever needed to be released, to make noise, to cry, to just allow whatever was buried deep inside to rise to the surface and be cast out, like an exorcism ridding my body of the demon traumas living in my hip joints, my pelvic area, my chest and shoulders. At first, I wondered if it would work, would I even be able to go deep on this sunny Eastern Oregon day? I hadn’t come to Pendleton for this, I’d come to help my parents with a house project but Tania's unexpected offer of a Yoga Therapy session was too intriguing to pass up. What buried pain would she find in the tightness of my hamstrings? What secret disappointment resided in the flexible-to-a-fault hyper-extension of my knees? And was I even sure I wanted to go there, right now? These questions were leaves floating down the stream, clouds blowing by on a cool breeze, evidence of Tania’s ability to guide and my willingness to receive her guidance. There were few words. When I tried to explain the tears, she encouraged me to breath, when I tried to explain the coughing she directed my attention back to the breath, inviting me to breathe into that place. When the Lion’s Breath spontaneously erupted, I had no explanation, I just let it flow. Tania didn’t miss a beat, she was at my head, encouraging me upward, crown on the floor, arched back, as I continued to gasp, choke, cough, and perform Lion’s Breath (a type of breath work/pranayama practiced in yoga) in what appeared to be an effort to expel some hidden toxin or blockage from my throat, and likely my mind, as well. Tania intuitively guided my journey in ways that sustained a feeling of freedom from judgement with a sense of safety and containment, while I released and let go and focused on my breath. Something changed for me that day, last Thursday. As Tania expertly returned my consciousness to the physical realm (if you’ve experienced deep meditation you know what I’m talking about), I experienced sensations new to me. I felt a rare but familiar emotional satiation, one might refer to it as blissed-out. As she brought me to a sitting position, prayer hands at my heart in the familiar way of yoga, my alignment was perfect, the tightness in my hips was gone and my shoulders were pain free for the first time in weeks. I felt and saw clearly in my mind’s eye, a shining golden light channeled up from the Earth through my center, exiting my crown, connecting me to all things before and now and after—if that’s too woo-woo for you all I can say is that whatever that feeling was, it was awesome and beyond explanation—it was the kind of healing that only comes from deep transformative medicine. After a bit, Tania brought me paper and pen. I wanted to write a book right there in that moment. A veil was lifted. I felt freedom I cannot yet describe, my breath felt and tasted different, my lungs had greater capacity, and my brain experienced a clarity I didn’t know I’d been longing for until that moment, a sense of knowing, a plan forming, a long lost calling heard on a new frequency, glory hallelujah I’ve been saved! Or at least that’s a descriptor that comes to mind when I try to explain how I felt in that moment, having moved through some kind of physical-mental-emotional-spiritual loop-di-loo water slide. A new level of something had been achieved. Consciousness? Healing? Personal discovery? Was this real? I chose not to question, not to have to understand, just to be and allow what is to express itself in the language of my body. Tania gently closed the session as we reflected together on the shared journey of opening up and of release. I know well from my own work in community mental health, that to hold space, to guide, and to bear witness to another’s soft spot, their fears and anxieties, their release and their growth, it is a journey for all but holds for each their own purpose and revelations. As I danced around the empty yoga studio waiting for Tania to finish her closing work, I performed a body scan, feeling each molecule as much as I could, not yet grounded. I admired my strong body in the floor to ceiling mirrors, basking in the sweet energy of such a beautiful space and noticed my face looked different. When I opened my mouth to speak, my voice felt different. Everything felt a little different, shifted. It’s unknown to me if it is the physical me that has shifted or the lens through which I view myself, just as I cannot say with certainty, how much of the stunning results achieved was the Yoga Therapy and how much was the practitioner, Tania Wildbill. Personally, it doesn’t really matter. What I am sure of, is that Yoga Therapy is the future, somatic therapies are the future (they exist now but I believe they will eventually come to equally complement “traditional talk therapy”). What happens to the mind, happens to the body and must ultimately be released by the body in collaboration with the mind. I’m not suggesting that talk therapy is useless, it’s not that concrete and I’d have a lot of useless skills (which I don’t) if that were the case. Healing is a nuanced experience, sometimes there are big shifts that feel like miracles, but mostly healing happens incrementally over time. Healing happens with the help of a support network, friends, family, spiritual leaders, coaches, mentors, Help Lines, and the kindness of strangers in passing. A lot of the time, healing involves professionals—counselors, body and energy workers, and yoga instructors & therapists. Healing happens through traditional modalities and through the casual unexpected experiences of a life unfolding. Tania encouraged me to eat, it aids in the grounding process, and informed me that I may experience effects from the session for up to seventy-two hours. I rode that feeling throughout my day and into the evening, heading to bed early feeling dreamy and ready to rest. The next day, I woke and went about my life in the typical way, though my mind continued to reflect on the previous day. Although that blissed out feeling was now a happy memory, I still felt, still feel, the positive shift experienced during that session. In the past few days I’ve written more than I have in the past few months, inspired by the body alchemist Tania and my continued interest in changing the current mental/behavioral health system. In a world where 450 million people struggle with their mental condition, nearly 44 million here in the U.S. or about 20% of the population, it's imperative that we start making changes to how we think about treatment and recovery for the neurodivergent brain and everyone else, too. You are not alone. We are not alone. The teachings and practices of yoga/yoga therapy offer us tools for healing and growth. If you or someone you love is suffering in the mind and/or body, I encourage you to check out Yoga Therapy. If you wonder what else you can try to move yourself forward or recover from traumatic experiences, consider Yoga Therapy. And if you get a chance, try Yoga Therapy with Tania Wildbill, it may just work for you too. With love, be well! This endorsement of Yoga Therapy is not a prescription and I share this with you as a woman, mother, sister, daughter, friend, who experienced it to be a healing endeavor. This is not medical advice, you know your unique special snowflake self best and our experiences of healing are individual and belong to each of us alone. There is no guarantee that my experience will be your experience. Yoga Therapy is one tool in the vast array of tools developing around the world in hopes of reducing suffering. I encourage you to work with your trusted people to find the tools that work for you.